Breathtakingly beautiful to falconers and non-falconers alike, the falcon family is diverse and geographically widespread. Members of the true falcon family are identifiable by the genus "Falco" in the name. This family has three branches, with falcon relatives, i.e. hawk falcons, forming a fourth branch. 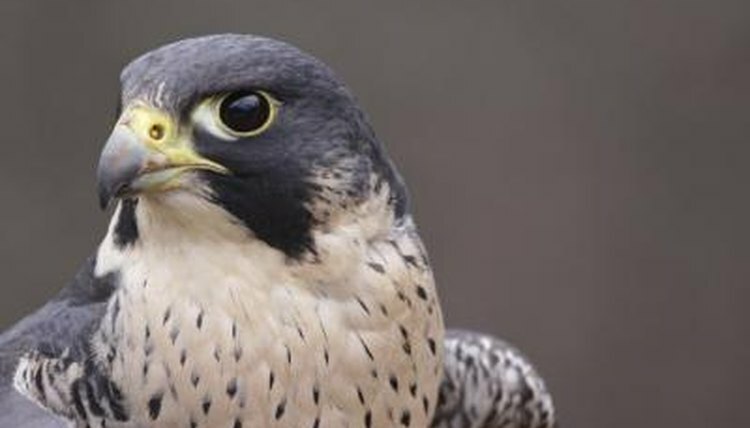 Although a falcon has few airborne predators to fear due to his speed in flight, some falcon breed populations are in a vulnerable state due to human pesticide use. There are at least 21 members of the falcon family according to AvianWeb. Breeds in this branch are the most powerful and generally largest of the species. The gyrfalcon and peregrine falcon probably are the best known members of this group. Native to North America and Europe, both of these larger falcon breeds are popular with falconers. The gyrfalcon and Saker falcon share a horizontal hunting style, whereas the peregrine has a distinctive swoop that has a dramatic visual quality. The Merlin, sometimes called a pigeon hawk in North America, is a smaller family member who nevertheless is known for robustness. The prairie falcon is another notable North American breed. The other members of this family are found more typically in Africa, Asia and Australasia. AbianWeb lists 14 kestrel breeds. Kestrels are sometimes called windhovers because of their hovering action in the air before swooping on its prey on the ground, which typically consists of small rodents, insects and lizards. The American kestrel is a small native breed, often incorrectly called a sparrow hawk. It is distributed widely throughout the Americas. Occasionally, the European common kestrel manages to make it to the east coast of North America. Other regions known for kestrel breeds are South Africa, Madagascar, Seychelles, Indonesia and Australia. The hobby family has the fewest members, with only four listed at AvianWeb. The hobby breeds are considered the most elegant of the falcons by falcon fanciers, because of his elongated pointed wings during flight. The hobby catches its prey while on the wing, which is a technique similar to that used by the true falcon group. He catches small birds or large insects, such as dragonflies, during flight. The four breeds of hobby are Eurasian, African, Australian and Oriental. Falcon relatives typically have the Latin name Herpetotheres, Caracaras or Phalcobenus. The laughing falcon, native to Central and South America, is a Herpetotheres breed recognized as part of the falcon family. There are more members of the Caracara branch. Birdlife International lists 11 Caracara breeds, although the Guadalupe Caracara is extinct, leaving only 10 surviving breeds.